Boyle slotted home a penalty midway through the first half after Conor Kane was adjudged to have fouled the Harps forward in the box. Drogheda started brightly and saw a lot of the ball in the opening minutes, playing a ball over the Harps defence, with Thomas Byrne just failing to get on the end of it. It was the visitors who took the lead on 17 minutes though with what would be their only shot on target of the game when Boyle converted from 12 yards. Drogheda should have levelled a minute later as Wixted’s corner to the back post found Mark Hughes. His volley was stopped at point blank range by Ciaran Gallagher before Chris Lyons’ rebound effort cannoned back off the post and Harps managed to clear. Sean Brennan played a free kick into the feet of Lyons on 20 minutes. Lyons beat his defender and looked to curl the ball into the bottom corner, but a deflection took it out for a corner. 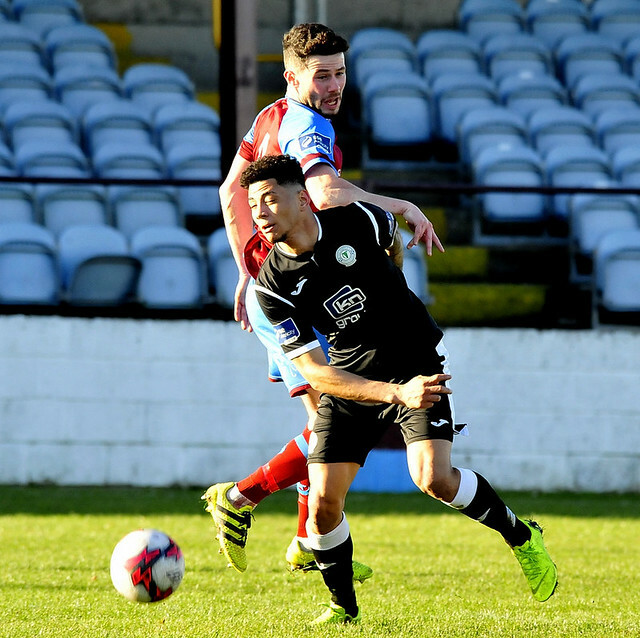 Drogheda continued to press for an equaliser and went close again before the half-hour mark. After a stoppage in play due to an injury to Drogheda captain Sean Brennan, Luke Gallagher sent a low driven free kick narrowly wide of the bottom corner. Caolan McAleer had the first chance of the second half for Harps, as he found space in midfield, drove forward but his effort never troubled Paul Skinner. A Drogheda free kick minutes later was controlled on the edge of the box by Luke Gallagher, who laid the ball off to Doyle. Doyle looked to bend the ball into the far corner but his effort didn’t dip enough to trouble Ciaran Gallagher in the Harps goal. Wixted was next to have an attempt for Drogheda, as he was played in by Doyle but saw his effort take a deflection and be saved comfortably by Ciaran Gallagher. Drogheda again pushed late on, as they won a number of corners, but couldn’t find an equaliser, with Luke Gallagher going closest with two headers. Drogheda’s preparation continues on Tuesday as they face a Republic of Ireland under-19 side, while Harps face Athlone Town next Saturday. Drogheda United: Paul Skinner; James Brown (Luke Heeney), Luke Gallagher, Luke McNally (Sean Trimble), Conor Kane; Mark Hughes, Sean Brennan (C) (Cian Kavanagh); Adam Wixted (Janabi Amour), Thomas Byrne (Eoin McPhillips), Mark Doyle (Jordan Adeyemo); Chris Lyons. Finn Harps: Ciaran Gallagher; Michael Gallagher (Tony McNamee), Keith Cowan, Sam Todd (Darragh Ellison), Daniel O’Reilly, Gareth Harkin; Niall McGinley (Stephen Doherty), Mark Coyle (Liam Walsh), Sam Verdon (Ryan Finn), Caolan McAleer (Raf Cretaro); Nathan Boyle (Mikey Place). Unused Subs: Jamie Bell (gk). Extratime.ie Player of the Match: Thomas Byrne (Drogheda United).